PR firms say it's all about telling compelling stories, but how much has been invested in it in terms of research and expertise? With the rise and rise of content marketing, we're back to the soft sell. Content marketing, or brand journalism, has some famous exemplars. Red Bull's viral ads are maybe the best-known, but Coke is executing the Coca-Cola Journey digital magazine, Marriott is partnering with Fast Company, Mashable, and Wired, while Nissan and Cisco have set up their own newsroom. The aim of each of these is to connect with target audiences in ways that are more compelling than the traditional spot or banner. In financial terms, it's a big deal. According to the Custom Content Council, content marketing in the United States was worth US$44 billion in 2013, but it's still a nascent business in Asia. But where does this leave the agencies? Both media and creative agencies have launched content marketing arms to cash in on the trend. PR agencies, however, are insistent that their roots in media relations prove their status as premier storytellers. But how long can they rest on their laurels as press release writers, and have these agencies invested further into this much-talked-about skill? Waggener Edstrom, for one, aims to show its chops with thought leadership. Its Singapore office has published a report describing content marketing as a long-term strategy which can indirectly generate revenue by focusing on customer loyalty and retention. The agency contrasts this with digital paid media, which is "short-form content aimed at driving a single and very specific outcome: clickthrough"
Zaheer Nooruddin, Waggener Edstrom's VP of digital, says the purpose of storytelling is "to lead consumers down the desired path that you want to lead them as a brand, whether it's advocacy, loyalty or purchase intent". Arun Mahtani, Edelman's regional chief content officer, calls storytelling "an audience-centric, rather than a brand-centric" approach. He also has a strong view on conventional practice, saying paid marketing relies on "interrupting" a consumer's media experience, where "storytelling takes second place to delivering the message". By contrast, PR professionals know their stories will only win space in media if they appeal to readers and viewers. Myrna van Pelt, general manager of Acumen Republic, says PR agencies are often tasked with crafting the story from start to finish. "Creative and media agencies can then evolve the story bed and create advertising content that continues the theme. Someone has to start the process and more often than not this is the role of PR." She describes storytelling as being about creating conversations that resonate. "We start with a master narrative that forms the core of the message, and is then supported by key pillars or themes." Mahtani adds that Edelman's approach starts with helping companies to put together a strategy that includes consumer mapping. That means not just audience preferences, but giving a "sense of what people care about and what sorts of content they want to consume". One part is to move the focus "from successes to stories", he says. "We delve into the art of finding a story and then bring it to life using words, images, performance, video and other media. We then apply those skills to a challenge or opportunity affecting the brand." Of course, a big driver of the brand storytelling trend is social media. With today's platforms brands are no longer constrained by the 30-second spot and "can deliver narratives with real complexity and depth", says Mahtani. But it also means that half of the story is being delivered by the audience. "A brand is a participant in its own story. This is a fundamental shift," says Nooruddin. It's not just about social, though. Nooruddin cites a campaign Waggener created for learning solutions firm Skillsoft built around a white paper on the industry and a roundtable. The campaign built awareness and delivered leads and significantly more media coverage and social media interaction. But agencies are coming up with a number of ways of measuring the impact of story­telling. Edelman tracks it over three phases. The first focuses on engagement through views and shares. The second phase tracks loyalty and trust, while the third phase measures the business impact — through rising sales, for example. Another approach, according to Waggener's regional analytics lead Stephen Tracy, is about tracking "not clicks and conversions, but the behaviours" of consumer groups. He says a Waggener study found that consumers who are highly exposed to branded content in a specific category are up to up to 40 per cent more likely to be advocates than those with little or no exposure. "The same goes for spending," says Tracy. "Consumers more exposed also spend much more at the point of purchase. In some cases they may spend up to 200 per cent more. 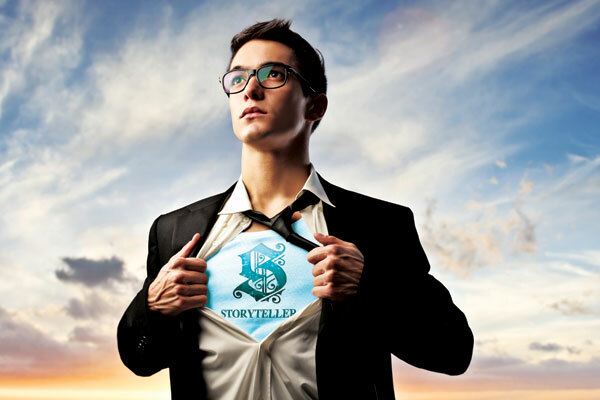 So storytelling has a business impact." Effective and differentiated storytelling has always been part and parcel of our strategy and is a key theme for every campaign. Our storytelling techniques borrow from the structure of classical storytelling, which revolves around crisis or failure in order to elevate tension and keep the audience engaged. The gap between present success and past failure makes for a far more compelling narrative, because without the past, the reader has no way in which to frame the story. This generates contrast and drama. Let's take a look at Atlas Sound & Vision, a local retailer in Singapore whose marketing revolved around their latest products. When they engaged us, we soon realised that they were a family-owned business whose ethos was about inspiring everyone with sound and vision. So our agency helped the store incorporate their legacy, history and vision into its brand story, resulting in its customers forming a sense of affinity with the brand and the company. Or, when Paypal launched 'Here', its credit card reader in Hong Kong, Hoffman decided to tell the story visually by creating an indoor 'Hong Kong High Street'. At this experiential event, media could meet each of the merchants face to face and talk to them, learning how they had started out, the challenges they faced and if Paypal's service helped them. When looking at the impact of storytelling, always measure it against the campaign's objectives. Some social media metrics that could be included in this measurement include: engagement, the degree to which your audience is talking about your brand; share of voice, how frequently the brand is spoken of, and the percentage relative to competitors; and 'message pull-through', how much of your story is captured by the audience, including tonality and sentiment. To put it simply, when people believe and buy into your brand story, you will enjoy stronger customer and employee loyalty, stronger engagement, and a higher share of voice. For years Nissan and Japan have relied on the power of monozukuri, the process of creating and manufacturing things. the 'what'. Now we are communicating the 'how' and the 'why', too, trying to dig out stories that help connect our company to our customers and prospective customers. We have relationships with agencies, but at the heart of this process is an in-house team. We need people who live and breathe what the company is doing: insiders. The type of people on this team is important, too. Nissan has hired former journalists who know what makes a story. As ever, we are driven by share of voice and overall opinion, and there are targets for both. With videos on platforms like YouTube even more data is available; who is watching, where they are, and how long we retain their attention. The audience is quick to make its own judgment and all the information helps feed our thinking as we work to strengthen the brand.